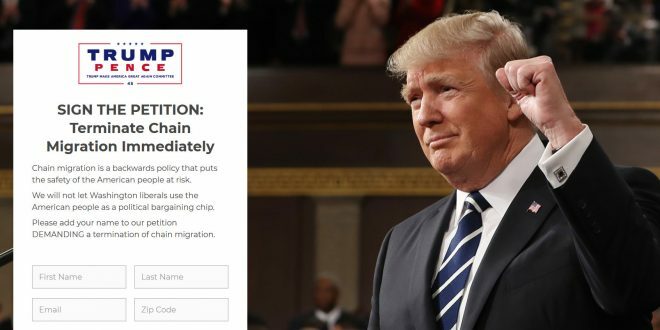 Trump Launches "Presidential Petition" To End Chain Migration Days After Melania's Parents Become Citizens - Joe.My.God. Friends, Our immigration system is in a state of COMPLETE CHAOS. Under current U.S. law, individuals can sponsor unlimited numbers of foreign immediate relatives for residency in the United States. THIS MUST END! Many of these chain migrants are not thoroughly vetted. This policy is a shameless Washington BETRAYAL of regular Americans whose safety is put at risk. I need every American on board to help end the despicable policy of chain migration. Friend, add your name to my OFFICIAL Presidential Petition to TERMINATE Chain Migration. All those boldings, italics, and random capitalizations are motherfucking theirs. Melania’s parents became US citizens on Thursday. The petition is here.